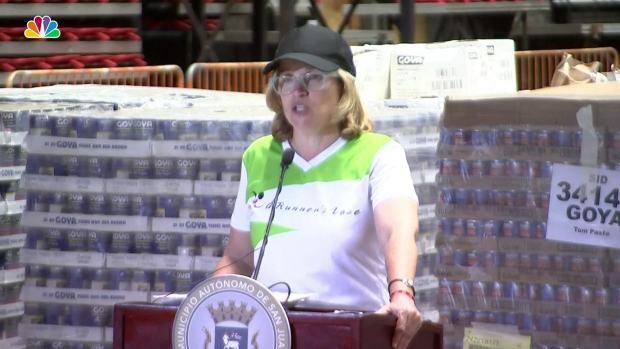 San Juan Mayor Carmen Yulin Cruz, who has tangled with President Donald Trump about the federal response to Hurricane Maria, suggested the White House did not want to hear her criticism. 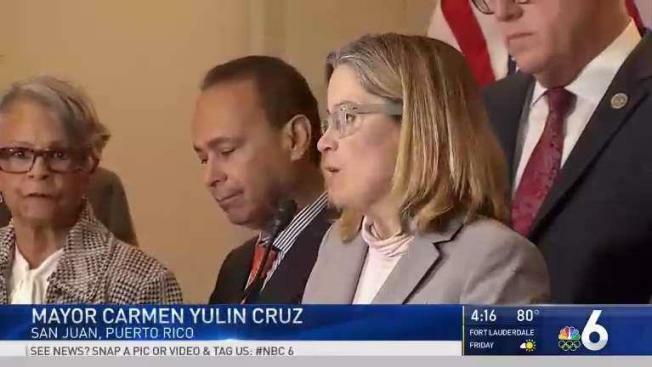 San Juan Mayor Carmen Yulin Cruz on Wednesday questioned why Republicans abruptly postponed a House hearing where she was scheduled to testify about the devastating impact of Hurricane Maria on Puerto Rico. Cruz, who has tangled with President Donald Trump about the federal response, suggested the White House did not want to hear her criticism. "There was a meeting scheduled for today that was canceled as I was getting to Washington," she said during a news conference with Democratic House members. "It is evident that this administration does not want to listen to the truth and does not want to own up to it." The mayor was referring to a hearing about the Federal Emergency Management Agency's preparedness and response capabilities that was scheduled for Wednesday morning and was supposed to include testimony from both Cruz and FEMA Administrator Brock Long. Rep. Bennie G. Thompson of Mississippi, the top Democrat on the Homeland Security Committee, who had invited Cruz to testify, told reporters he was given no explanation for the postponement. "It is inexcusable that the Republicans have delayed this hearing for the third time with no rational reason in a blatant attempt to silence the mayor and shield the Trump administration from another bad news story," he said. A committee aide told The Associated Press that Thompson had requested the witness Friday evening, leaving only the weekend to plan for a panel of state and local witnesses. The aide, who was not authorized to speak to reporters and spoke on condition of anonymity, said that given the short turnaround time it was not possible to assemble a full second panel of witnesses to reflect areas of the country affected by recent natural disasters. Cruz reiterated her criticism about the federal response, which she called "inadequate" and "insufficient." "The situation is still a life or death situation" a month after Maria hit the island, she said. "Survival cannot be our new way of life." Cruz objected to the grade of 10 out of 10 that Trump has given to the federal response to hurricane-ravaged Puerto Rico. "It really is 10 out of 100. President Trump lives in an alternate reality. While we are feeding our people, he is in Mar-a-Lago playing golf," she said. Cruz asked that Congress spare humanitarian aid to Puerto Rico for four years from the Jones Act, a federal law that prohibits foreign-flagged ships from shuttling goods between U.S. ports. Cruz also said a federal control board that oversees Puerto Rico's finances has taken $350 million away from municipalities, money that is much needed. Puerto Rican authorities have estimated that the island suffered an estimated $45 billion to $95 billion in damage. So far, Congress has approved nearly $5 billion in aid for the island. Cruz plans to meet Wednesday with Sens. Bernie Sanders, I-Vt., and Mark Warner, D-Va., before returning to San Juan on Thursday morning.